Robotiq has launched a new vision-guided pick and place solution for Universal Robots that can be setup on a factory floor in 5 minutes. No external PC is required to setup, program or run the Camera. Everything is done right from the robot user interface. Early users of the system say Robotiq's Camera opens new possibilities for automation. "The Robotiq Camera breaks all the integration barriers that we usually see with vision systems in manufacturing automation. We could think of many pick & place robot tasks that can now be programmed very fast. We will need this solution for upcoming projects with UR robots," says Victor Canton, Manufacturing Engineer, Continental Automotive Spain SA. "We kept seeing projects that would work much better with machine vision, but manufacturers stayed away because of the complexity and cost of existing solutions," explains Samuel Bouchard, CEO of Robotiq. "This is why we set out to create a camera and vision software that could be set up and used by anyone." The compact camera design fits perfectly on the UR wrist and offers direct connectivity to the controller. Moreover, the Robotiq Camera's user friendly software is seamlessly embedded within Universal Robot's graphical user interface. 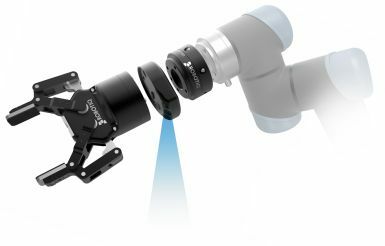 Robotiq's vision system for Universal Robots is commercially available now.